At 12:00 p.m. today, throughout the world, people gathered to sing Ukuthula which is Zulu for peace and is a traditional South African song. I was pleased to be part of the celebration at Gonzaga University in Spokane, WA to note the International Day of Peace. I visited Gonzaga University twice before when I was at the U.S. Institute of Peace. So I was glad to reconnect with my colleagues there. My visit to Gonzaga is part of road trip that tomorrow will take to the Jeannette Rankin Peace Center in Missoula, MT and the Peace and Justice Studies Association annual meeting in Nelson, BC, Canada over the weekend. While at the university, I supported a number of initiatives. When I arrived on Wednesday night I attended and spoke briefly at a joint celebration of the work of human rights groups in the area. The event was a collaboration of the Spokane County Human Rights Task Force and the Hate Studies Institute at Gonzaga University. This event was the start of a collaboration between these two efforts. Today, my day started with meeting with the advisory board of the Hate Studies Institute which publishes the Journal of Hate Studies. The program was established in 1997 in the wake of acts of extremism against minority groups in the region. The purpose of my meeting was to facilitate a conversation on ways in which the program and journal could work more closely with students. Community Action and Service-Learning. We looked at ways of promoting experiential learning with undergraduate students and supporting international students. I also talked with a class in the Solidarity and Social Justice Program on careers. 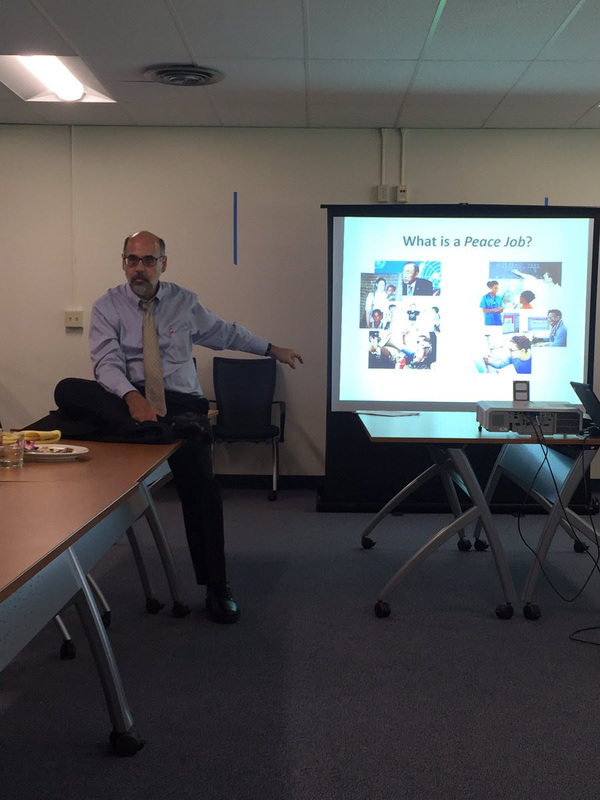 At lunch I gave a presentation to the Career and Professional Development Center staff on my book Peace Jobs: A Student’s Guide to Starting a Career Working for Peace. I also conducted a 2-hour faculty development program with educators from the Spokane region including from Gonzaga University, Whitworth University, and North Idaho College. In addition, I met with faculty in the MA in organizational leadership program. At this session, I talked about my work in graduate education, particularly focusing on the work of the Forage Center. The last program of the day was the largest with some 200 students attending. I was interviewed in a “fish bowl” format on my book. Students posed a range of questions including considering the struggles of students looking for work, mediation when bias is an issue, and examining various disciplines as the foundation for careers. Other events of the day included a community world peace flag ceremony organized by Pax Christi. This event included reading the UN Millennial Development Goals. Gonzaga University, as a Jesuit Catholic university, espouses values and a mission that align with promoting social justice and peacebuilding. By making the International Day of Peace an important celebration, it is emphasizing important community-wide goals that students can seek in their studies. Previous Whitehead State Department Student Conference: Discover Diplomacy, 10/26/16: Registration is Now Open!